Dr. James Dunford is Professor Emeritus in the UCSD Department of Emergency Medicine. Jim was appointed medical director of the San Diego Fire-Rescue Department in 1986 has served as the City EMS Medical Director since 1997. He oversees 500 paramedics, 600 firefighters and 30 emergency medical dispatchers at the San Diego Fire Communications Center. Jim practices in the UCSD emergency department (ED) and trains medical students, residents and fellows. Jim attended Syracuse University and Columbia University College of Physicians & Surgeons He completed an internal medicine residency at UCSD Health Center and is board-certified in emergency medicine and internal medicine. Under his mentorship the San Diego EMS system has achieved international recognition. Dr. Dunford joined the UCSD faculty in 1980 serving as ED attending, flight physician and later medical director of the Life Flight helicopter program. In 1996 he won the Society of Academic Medicine national faculty CPC competition. He then founded and directed the UCSD emergency medicine residency program before returning to EMS. His academic interests center on creating novel EMS applications and health information technology to achieve population-based solutions. 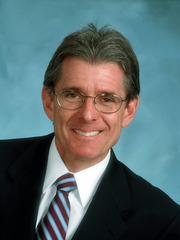 Jim was the principal champion of the San Diego regional heart attack, stroke and public defibrillation systems. He directs the Serial Inebriate Program and created the community-paramedic based Resource Access Program, which address chronic homeless alcoholics and frequent EMS users, respectively. He is a co-investigator in the NIH Resuscitation Outcomes Consortium trials, collaborates with numerous local investigators and serves as emergency medicine expert at the National Quality Forum. Jim has contributed extensively to the community, serving as chair of the California STEMI Task Force, completing six terms as President of the Board of the San Diego American Heart Association. He has chaired the San Diego Clean Syringe Exchange Program continuously since 2002, and serves on both the Downtown Partnership Ending Homelessness Leadership Team the Community Information Exchange Leadership Team. Jim has received the Department of Emergency Medicine and Family Medicine Golden Apple Awards for Teaching, the AHA Western States Volunteer Physician of the Year Award, the San Diego Physician Health Care Champion Award, the UCSD Chancellor’s Award for Community Service, the U.S. Interagency Council on Homelessness Research Award, the Michael K. Copass Award, the UCSD Leonard Tow Humanism in Medicine Award, the San Diego Metro Mover to Watch Award and the Physio-Control EMS Innovator Award. He has been selected seven times as a Top (EM) Doc by his peers in the San Diego County Medical Society. His wife Renee is a nurse and they have 3 sons.